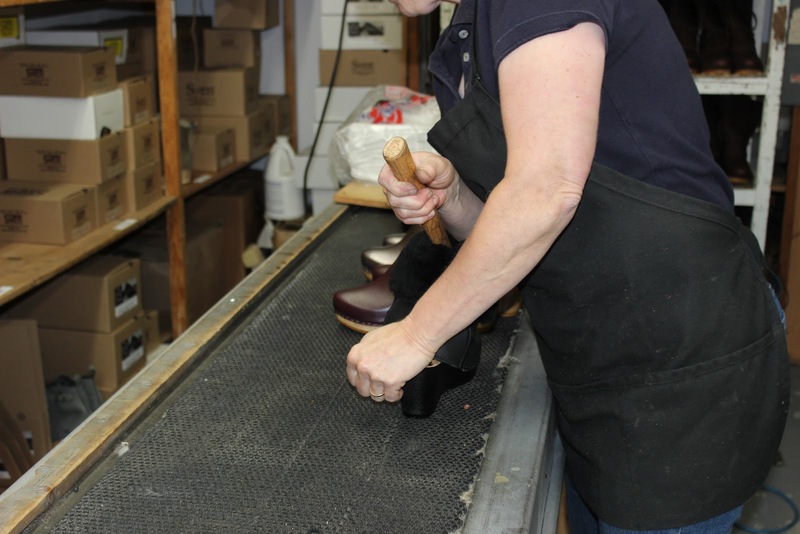 Life and Style by Lisa B: Blog about Clogs! 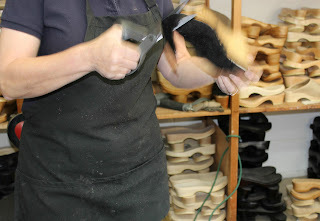 Here it is the highly anticipated post about visiting Sven's clogs! I am going to start by saying that the folks that work at Sven's are so GREAT! I had such a fun time meeting them and touring the factory. They are some of the nicest people I have meet in a long time! 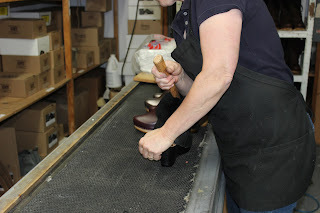 They also provided awesome customer service in designing my clogs so they fit just right!!!! My tour was on a Sunday. I was to meet Lisa at the factory at 1:00. When I arrived I knocked on the door and saw that there was someone in the building working. I guessed that it wasn't Lisa because she is the marketing and public relations gal, so I figured it was one of the staff working some extra hours. I walked in and this energetic sparkling person said "Hello, you must be Lisa, I'll get Lisa". I said "Thanks" and waited. Lisa came down and said "Oh, I see you have met Marie". I said "Oh, that's Marie" and thought to myself "the owner is working on a Sunday"! That wasn't what I expected..
You see, Sven's manufactures their own line of clogs, but they also manufacture clogs for high end designers like No.6 and Loeffler Randall. I thought that since the clogs were big time that Marie would have a nice big office upstairs and her staff would do all the work, but that is not how Marie works! I have never seen someone so passionate about what she does! 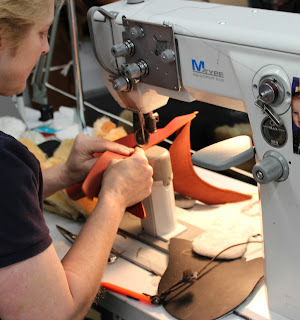 On some of the higher end shoes she is the only one that creates them because of the very intricate steps. She is Sven's clogs! Marie took me through the steps to create a clog! Has anyone ever actually thought about the steps that need to occur to create that shoe on your foot? It's amazing! The fact that Marie and Lisa took time out of their day to show me the process is also incredible! 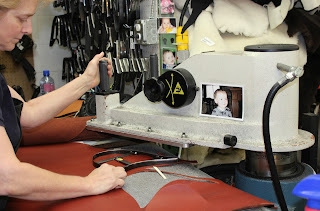 Attaching the upper to the base (that's one powerful stapler). Look how close her fingers are to it! And voila! You have a boot! Cool! 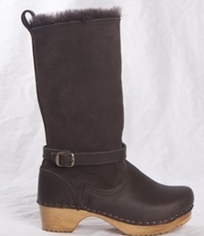 Maybe it's because I am a shoe lover and now a clog lover! They are so comfortable! 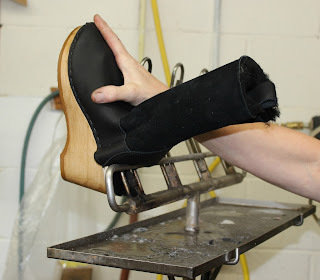 Tune it tomorrow where I will reveal the clogs that I had designed for me!!!!! P.S. Sven's is having a warehouse sale on September 28th and 29th! They will be selling all of the overstocks that they have! If you live in the area you should check it out!! Wonderful post. 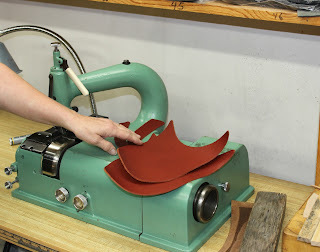 I love the way you describe the whole process of making clogs. The images you shared gives a live feel of the work. After reading your post, I’m going to buy one more pair of wooden clogs for me.